A simple map application which uses tile graphics from the OpenStreetMap project and the rendering engine of the OpenLayers project. Supports free navigation mode and GPS position center mode. Choose from three different tile graphic sets (osmarender, mapnik, cyclemap). Displays GPS coordinates, accuracy and speed. GPS position marker shows the heading if available. Supports all zoom levels supported by the selected tile graphics set. Supports night mode which displays the map with darker colors. Supports full screen and allows enabling/disabling of various information. The command menu automatically disappears and can be opened again by tapping the map. In that way the whole screen is free for displaying the map. Supports metric and US customary system. Supports keyboard shortcuts for moving and zooming the map. This application is open source using the MIT License. Source code is available here. When you choose a specific display orientation and then switch back to free orientation then this is not working immediately. You have to restart the application to get working free orientation. Haven't found out yet what causes this. Maybe it's a Mojo issue. Night mode really only makes the map darker. I can't switch to totally different tile graphics and I found no possibility to "invert" the graphics in webkit (which would be a really cool night mode). In very rare situations the map doesn't display anything, even the GPS position marker is gone. This looks like an issue with the OpenLayers library. If you encounter this problem then simply change the zoom level and the map is working again. Sometimes the displayed position is totally wrong even when there is a GPS fix with good accuracy. But in these situations the Google Maps application also shows the same wrong position so this must be an issue with the GPS hardware and not with my application. So if you think Minimap displays the wrong position then please first check with Google Maps before sending me bug reports. 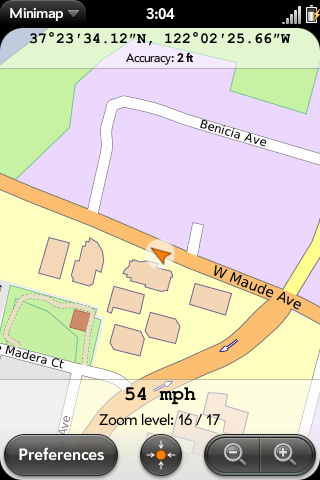 Switched default map graphics to "mapnik"
Center button now always locks center to GPS position, even if already done. Unlocking is only done by moving the map manually. Much more intuitive this way. Center marker now shows an arrow pointing to the position marker if position is not locked to center. This helps to find the position again after manual map movement without using the center button. Added support for screen timeout blocking. Added setting for switching between metric and US units.